DADE CITY, Fla. — A child had to be taken to the hospital on Wednesday afternoon after he got trapped in a pool pipe at a home in Dade City, according to Pasco County Fire Rescue. PCFR responded to a home in the 34000 Block of Sahalee Loop around 3 p.m. When firefighters arrived, they reported an adolescent male in the shallow end of a pool, with his arm stuck in a PVC skimmer pipe. Firefighters on the scene set up command and started to remove the pool decking that was covering the pipe by using hammers and chisels. Command on scene called for assistance from Pasco County facilities for a jackhammer to free the boy's arm. It took approximately an hour and fifteen minutes to dig under the pool deck, cut the PVC pipe the boy's arm was entrapped in, and free the boy. A section of the pipe remained on the boy's arm, and he was transported to a local hospital to have the pipe removed. 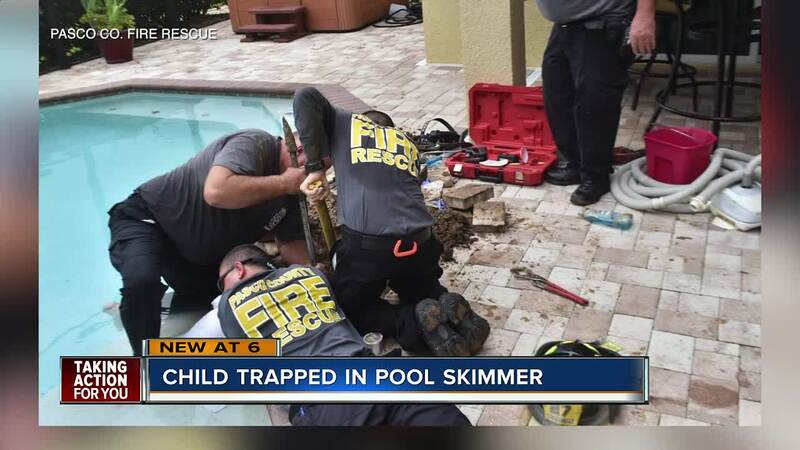 Officials determined that the boy was playing in the pool, stuck his arm into the PVC skimmer pipe, and got stuck.